Branford Marsalis’ 2002 album, Footsteps of Our Fathers, which included his quartet’s recitation of John Coltrane’s four-part suite A Love Supreme, drew mostly favorable reviews, though at least one critic (ahem) found it stiff, emotionless and unnecessary. 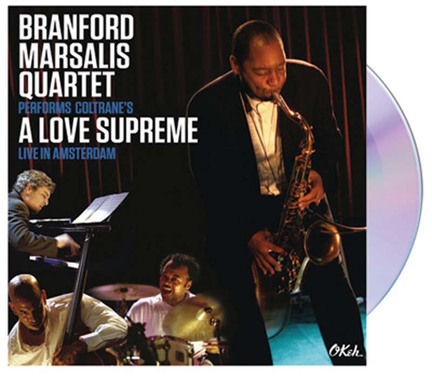 Fifteen months after recording Footsteps, however, the Branford Marsalis Quartet gave a performance of A Love Supreme at an Amsterdam concert hall that amounted to a stunning tour de force. Originally released on DVD in 2004, that concert has been reissued as a CD/DVD set to celebrate the 50th anniversary of Coltrane’s watershed recording. The quartet-Marsalis exclusively on tenor saxophone, with pianist Joey Calderazzo, bassist Eric Revis and drummer Jeff “Tain” Watts-is more spirited, more powerful and more expansive than on the studio recording. The suite runs significantly longer here, as the quartet stretches each movement out. The band’s trademark style, deftly navigating the narrow channel between swing and freedom, reminds us why Marsalis-Calderazzo-Revis-Watts was one of the most dangerous, exciting combos in jazz. A rumble of mallets on toms introduces part one, “Acknowledgement.” Marsalis blows an elegant, expressive statement, and when Revis plucks those four familiar bass notes, the audience erupts. Four minutes in, Marsalis unleashes a torrent of notes while Watts, one of jazz’s most forceful drummers, thrashes furiously, though his facial expression implies that it takes him little effort to do so. He is in a zone. Revis solos sparsely between movements, and then Marsalis states the well-known theme of part two, “Resolution,” bending notes dramatically. Calderazzo-who watches each of the other members intently, looking for cues-turns in his first major solo of the evening here, beginning tastefully but growing faster and faster until eventually his hands are a blur. After several minutes, Marsalis returns and constructs a wall of sound with arpeggios and rapid-fire scalar runs. A long drum solo-Watts just stares straight ahead, at nothing, while his arms flail-segues into part three, “Pursuance.” After a brief statement by Marsalis, the rhythm section engages in a battle of wills. Calderazzo’s fingers fly at breakneck speed, and the viewer can’t help wonder how his brain can possibly direct his hands at such a pace. (To hear improvisation on record or even in a jazz club is one thing; to see such crisp close-ups is quite another.) Finished-or tired-Calderazzo and Revis lay out, and Marsalis and Watts duel in a manner that recalls Coltrane’s explorations with Rashied Ali. Part four, “Psalm,” starts with Revis soloing unaccompanied, sweat dripping off his head. Then comes the reverential final statement, and Marsalis grows increasingly volatile, like a hurricane gathering steam. Against a backdrop of thunderous mallets, and without the “a love supreme” chant of Coltrane’s original, the quartet pushes toward its rapturous conclusion. The DVD contains bonus material, but unfortunately it’s not worth watching. Musicians-not just the quartet members, but others such as Miguel Zenón, David Sánchez and the late Michael Brecker-talk about A Love Supreme, and an interview that Marsalis conducts with Coltrane’s widow, the musician and composer Alice Coltrane, is amateurish. The only interesting part of the bonus footage is an unguarded moment backstage after the Amsterdam show: Marsalis is ecstatic over the performance and reveals that the previous night’s show wasn’t up to par because it lacked emotion. “Anybody can play the notes,” he says. That was exactly the trouble with Footsteps of Our Fathers, and its existence illustrates why this evening was so magical.